90 Comments	This post may contain affiliate links. 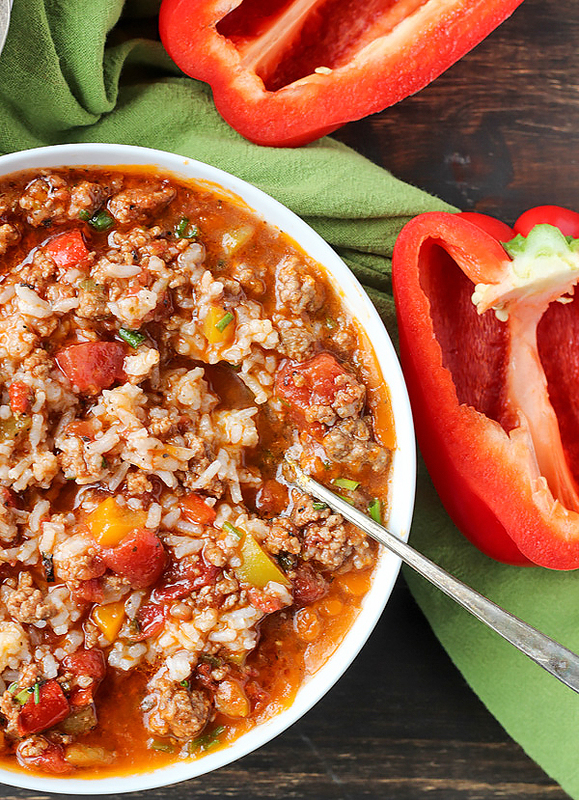 This Paleo Whole30 Stuffed Pepper Soup is easy to make and so hearty. 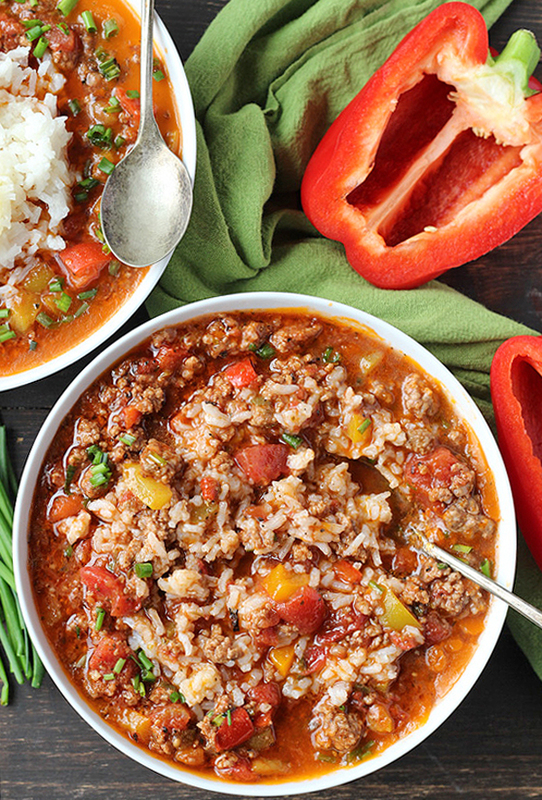 All the flavors of a stuffed pepper in soup form. Gluten free, dairy free, and low FODMAP. Made in the Instant Pot or on the stove top. Updated September 2018 by adding photos without rice. Recipe is the same. I’m back with another amazing soup. They are definitely a favorite of mine during the colder months, and judging on how popular they always are, you guys love them as well. 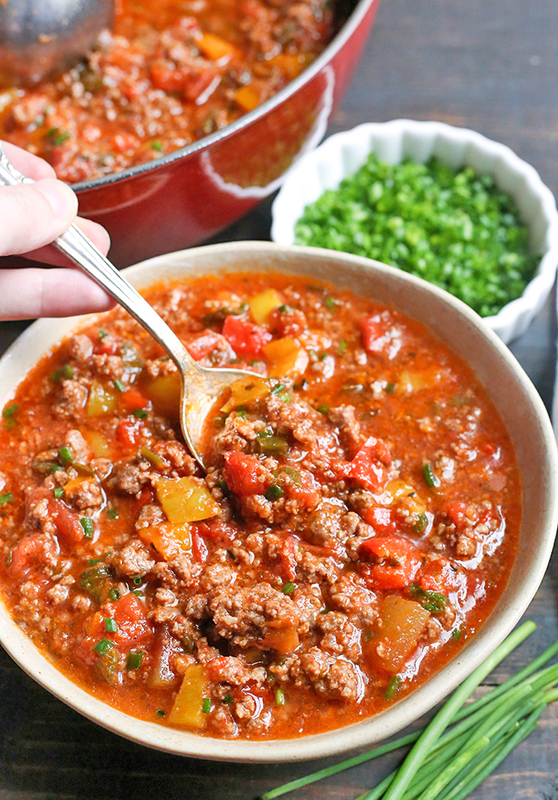 This soup is packed with deliciousness. 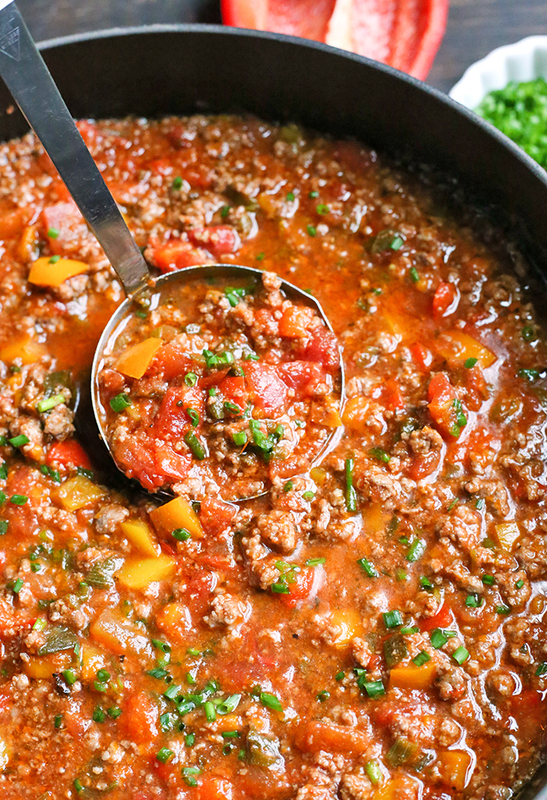 Lots of bell peppers, fire roasted tomatoes, grass-fed ground beef, and seasonings that give it so much flavor. Yes, there is white rice in some of these pictures. We tolerate white rice ok and if you do as well then I highly recommend it! If you’re doing a Whole30 or can’t handle rice, then use cauliflower rice or leave it out. 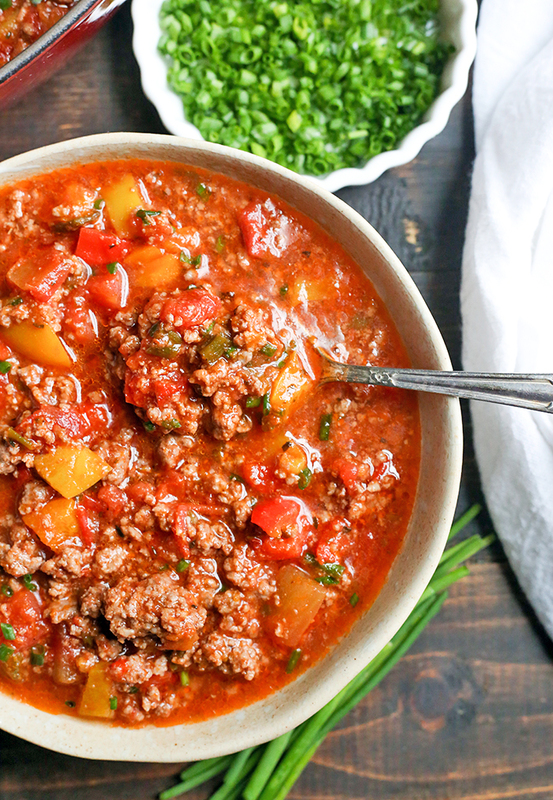 It’s still hearty and flavorful without it. I made this twice in one day to try it out both on the stove-top and in the Instant Pot. As usual, the Instant Pot version was my favorite. It was less hands-on time and came out just as good as the stove-top version. 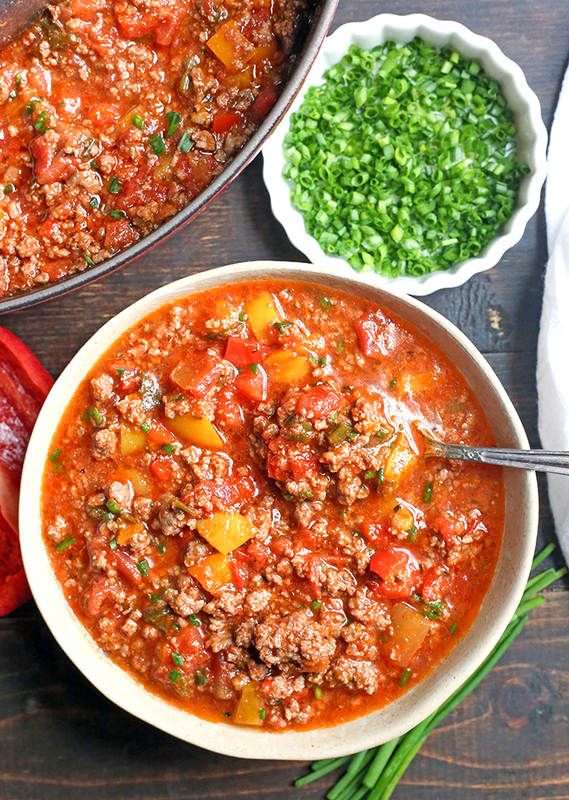 This recipe is low FODMAP which means no onion, garlic, or green peppers. If you don’t need it low FODMAP then feel free to add regular onion with the peppers, use green pepper if you’d like, and garlic instead of garlic oil. 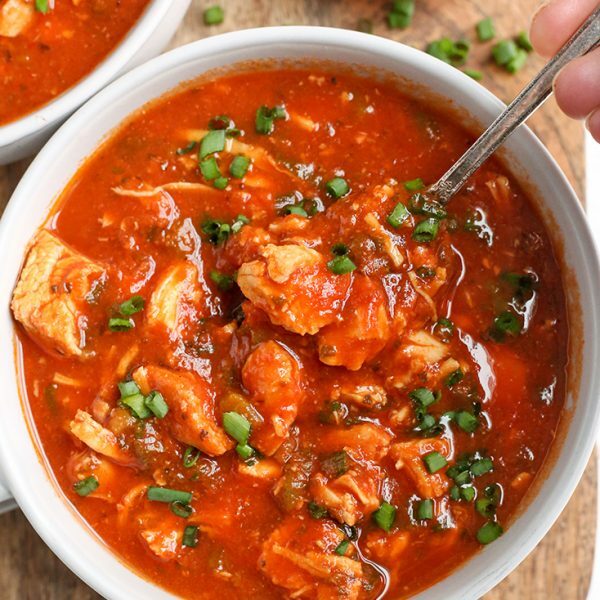 Here are some more soup recipes you’ll love: Paleo Whole30 Chicken Pot Pie Soup, and Paleo Whole30 Creamy Chicken Tomato Soup. Hit "cancel" and release the pressure. 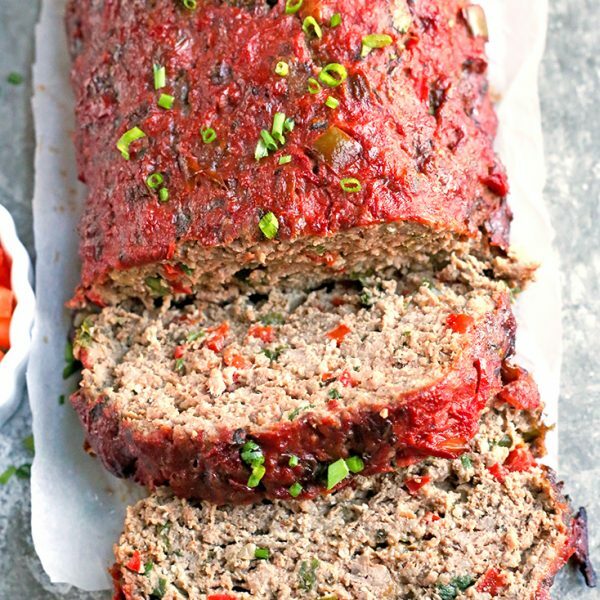 Serve with rice or cauliflower rice. Add garlic oil to a large skillet and cook the peppers over medium heat for 5 minutes, until tender. Add the beef, salt, and seasoning and cook until browned, 5-7 minutes. Add in the tomatoes, green onions and water and cook 10 minutes. Add in the rice if using it. Serve hot. What’s the “serving size” for this to be Low FODMAP, since tomatoes are only Low FODMAP in about 1/2 cup serving? Thanks! I made this in the Instant Pot for a family gathering. Three people asked me to share the recipe with them. 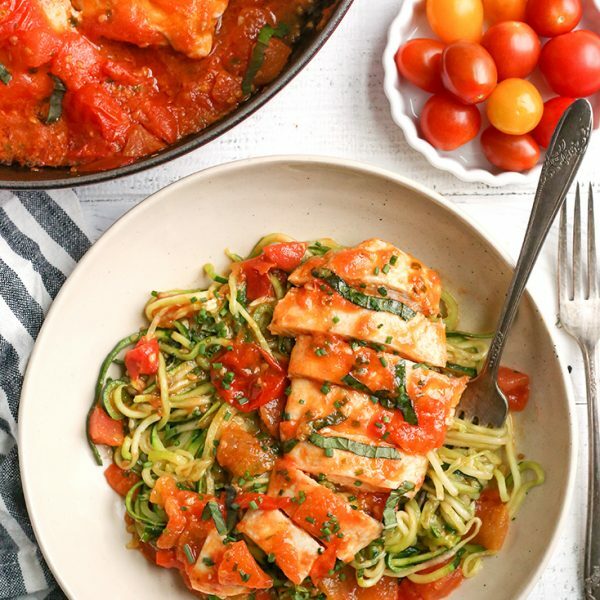 A great Whole 30 recipe! Thank you so much. Delicious! You’re welcome, Barb! Thanks for trying it and I’m so glad everyone loved it! Hi Hiliary- as much as you want 😉 I don’t calculate that because that is so personal. I say eat how much makes you feel satisfied. Hope you enjoy! I have made this recipe 3 times now, since I first saw you share it on the Whole30recipes IG – it’s wonderful! Definitely a crowd-pleaser and a go-to at our house! Thanks, Rachel! I’m so glad you like it! 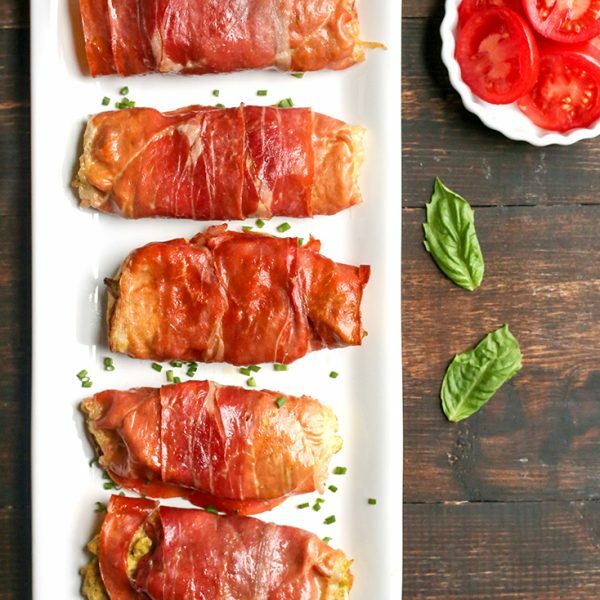 Do you have any estimate of calories for this recipe? Hi Rachel- I don’t, but you can use a site like My Fitness Pal to calculate it if needed.